do gas masks need support to preserve their shape? As the title suggests, I've been wondering if gas masks need some sort of filling when they are stored in their bags. I've seen unissued gas masks that have some type of cardboard or paper filling and was thinking about looking for a reproduction to go with my gas masks, especially the M5, to aid in shape preservation. Deformation seems to be a risk factor without good filling in case of longer term storage. Or what do you suggest? A gas mask IS going to gradually fall in on itself if stored without some sort of shape support. The bubble wrap sounds like a great, effective and cheap solution. Hadn't thought of that. Thanks! Another trick I've seen is to slice a styrofoam head mannequin in half longwise, lay it on its flat side, and place gas mask over the face. Gravity alone will keep the shape nicely. Edited by Bluehawk, 04 April 2019 - 08:58 PM. I was thinking about that the other day since I've got an M5 set up back home in storage. Thanks for the topic and advice! Ken, what's the date and story on that picture? That's the first time I've seen a UL marked bag in a period photo. 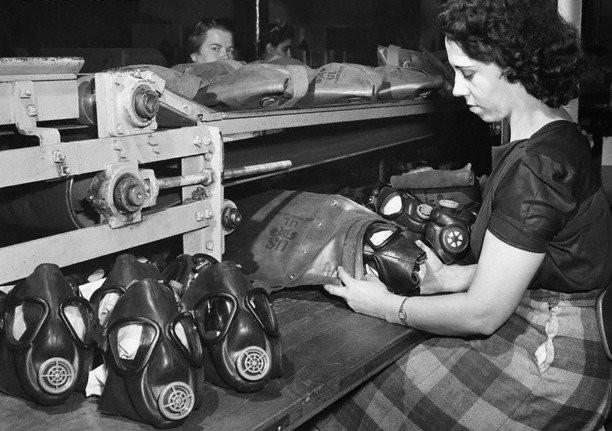 I couldn't find a date but I recall learning that the M-5 assault gas mask was only made in 1944. The production was discontinued late in 1944 because of problems with the rubber, apparently it was not as resistant to cold temperatures and moisture as the army had hoped. So I'll go out on a limb and date it 1944. Would be nice to know what factory the picture was taken in but unfortunately, there's no additional info, at least not where I found it. I already stuffed mine with bubblewrap. Works great! Thanks again.